Ace, Tiara, Dream, Bridget, and Lady would tell you if they could. Retired racing Greyhounds can lead rewarding lives with senior citizens. To see these dogs so bonded with their adopters speaks volumes. The fastest breed of dog in the world coupled with people who are well past their prime may seem an unlikely match, but just because people are eligible for senior citizen discounts that doesn’t disqualify them from owning dogs or restrict them to teacup poodles. I have yet to see a profile of the perfect Greyhound adopter. All age groups have their pluses and minuses. On the minus side, young adults’ lives aren’t settled and dogs may not fit in with their life changes. Families with children may find they are too busy to attend to their dogs or may not provide adequate supervision with young children and dogs. Many middle-aged couples work long hours, and some divorce and move to living quarters that won’t allow dogs. Seniors may encounter health problems or may not outlive their dogs. Adoption groups are becoming familiar with the need to take in retired racers that through no fault of their own have lost their homes after having been placed in any of the previously mentioned situations. Greyhounds placed in seemingly perfect homes may end up back in the adoption system again. Fortunately some people recognize the joys of adopting older Greyhounds. One motorized wheelchair-bound senior adopter adopted her little black Greyhound girl many years ago when she was married. Due to deteriorating health she eventually had to go to a nursing home and was able to take her beloved dog, KC, with her. After the woman died, this sweet older Greyhound was adopted by one of the nurses. One advantage of having seniors adopt Greyhounds is that they are unlikely to be gone from home working 40 to 60 hours per week. Nor will they be gone for hours chauffeuring the kids to baseball, ballet, and birthdays. Many seniors have spent a good part of their lives with dogs and understand the basic responsibilities involved. They have more time — quality time — for their pets. Dogs don’t discriminate by age. A dog will bond just as easily to a 70-year-old as it will to a 30-year-old. For many seniors, a dog is a reason to get up in the morning. Dogs can help them get needed exercise and can greatly enrich their lives. I enjoy having seniors and their Greyhounds participate in our adoption demos as their presence makes it clear that one doesn’t have to be an Olympic athlete to adopt a Greyhound. Over the years I’ve met a number of special seniors who have adopted Greyhounds. What follows are some of their stories. Edith Dyer was the first senior adopter I met. At age 73 she adopted her Greyhound. Her husband just died and her male Doberman had significant health problems. She saw a TV segment on adopting Greyhounds and went with her daughter and granddaughter to the REGAP (Retired Greyhounds As Pets) kennel at the Seabrook track. She was shocked at the number of Greyhounds needing homes and would have had an impossible time selecting one, but the little fawn female who nuzzled her granddaughter won her heart. Her Greyhound Tiara lived happily with her Doberman until he died six months later. Edith was convinced that retired racing dogs could make great pets and made a cardboard sign that said, “Adopt a Greyhound” and taped it on a window of her car. She would occasionally show up at our adoption demos and took Tiara to the State House in Maine to show support for a bill to ban Greyhound racing. Although her house is on 10 acres of property she hasn’t fenced in an area for her dog, preferring to snap on the leash and walk her dog several times a day. Her cats Jasmine and Gabriel like to tag along. Even in the icy winters Edith and Tiara bundle up and she puts on the boots with cleats, always enjoying the beauties of nature when they go out. She describes Greyhounds as wonderful, intelligent, sensitive dogs and can talk at length on the virtues of retired racers. If her back is bothering her she can tell Tiara to go easy and this intuitive dog responds. They have been almost constant companions for nine years. Edith is now 82 and Tiara is ten-and-a-half. Six years ago, after his elderly Beagle died, Dr. Bill Wyatt looked at dogs in animal shelters and found their pleading faces overwhelming. He saw a notice for an adoption demo I was doing for Maine Greyhound Placement Service (MGPS) and was so impressed with the gentle dispositions of the group of demo dogs in the small store, he made an appointment to go to the adoption kennel the next day. Bill was 67 years old at the time. Ace, a handsome brindle Greyhound, settled into the Wyatt’s home and took Beagle’s place in the doctor’s office where he often gets attention from dog-loving patients. Bill has gradually cut back his medical practice to two days a week, leaving more time for them to do errands together and to share an afternoon nap snuggled on the bed. (At night, Ace settles for the couch as the doctor’s wife gets the spot in the bed, but he visits a few times a night to check on his master.) Ace has loved the fenced-in area that was put up for him a while ago and runs with the dogs that live next door with the Wyatt’s son and daughter-in-law. Over the years we have watched Ace’s face turn as white as his adopter’s hair because both regularly help out at our demos. It’s always a treat to have them attend, as Bill’s dry sense of humor spices up things. He is now 73 and Ace is nine-and-a-half. According to the doctor, Greyhounds make great pets for seniors because they are so in tune with people and are loving and undemanding. He and Ace seem to communicate by ESP because they know each other’s routines so well. When Elmina Sewall describes Greyhounds as “the perfect dogs,” this is a very high complement indeed. She brought home her first dog as a teenager and over her 88 years has shared her life with countless breeds. She had a special interest in Pug dogs and bred and judged them, placing one with the Duke and Dutchess of Windsor. She has had up to 20 dogs at a time! For 17 years she served as president of the West Kennebunk Animal Shelter that now bears her name. The Greyhound bug didn’t bite Elmina until she was in her early eighties. Five-and-a-half years after one of our demos, she read a feature in her local paper on the plight of retired racing Greyhounds and their need for homes and called MGPS. Elmina had a small mixed-breed female from the local animal shelter when she adopted her first Greyhound, Ashana, a red fawn female. Two years later, Bridget, another red fawn girl, joined her pack, and two months later, Dream, a brindle female, was adopted. Elmina even tried to give a chance to a “Free to a good home” Greyhound she saw advertised in the newspaper, but found it extremely aggressive. Watching her three retired racers run in their mowed, fenced-in meadow, chasing flying birds, was a joy to behold. The best part was seeing them run back to their mistress, out of breath and exuberant. A year ago Elmina broke her hip and now walks with a cane now. This has cramped this vibrant octogenarian’s style, as she is no longer able to walk around the meadow with her dogs or take them for walks in the woods. Fortunately she has staff that love her dogs and give them exercise and care. Elmina thinks Greyhounds are great pets for seniors because they are quiet and easy to manage, despite their size. Her girls are nice companions for her as she reads and does her paperwork. Her first Greyhound Ashana and her little mixed-breed dog, Jessie, recently died. Greyhounds Bridget and Dream look very happy and healthy in this special home. 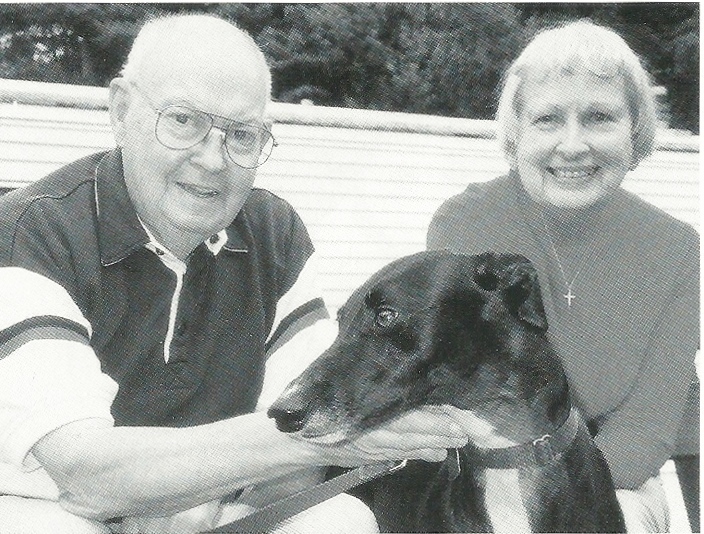 Don and Edith Bailey heard that retired Greyhounds make good pets. When the last of their three Siberian Huskies died, the Baileys managed to find their way to the MGPS adoption kennel. Their daughter knew her dog-loving parents would adopt a Greyhound. Our kennel manager told them they would need to set up an appointment to discuss adopting a Greyhound. They observed many Greyhounds in the turnout pen, but a small, shiny, black female with a white bib and toe tips caught their eyes. When they returned for their appointment they were shown five suitable dogs, but this little Lady Onyx was the one they would go home with. That was over a year ago. Don is now 84 years old, Edith is 79, and Lady is almost four. Lady rapidly became friendly with Smokey, the deaf cat, and the two of them dash back and forth inside together. She has her favorite toys that she knows by name and runs around with them in her mouth. A retired baker, Don still likes getting up early and takes Lady for her first leash-walk of the day. They use a harness on her to minimize pulling. The Baileys appreciate that Lady helps them get the exercise they need and enjoy. Both Don and Edith are in love with Greyhounds and think they are intelligent, gentle, quiet, and easy-to-manage dogs. They often help at our adoption demos with their gorgeous little girl and have an “Adopt a Greyhound” bumper sticker on their station wagon. For many active seniors I’ve met, dogs have been and continue to be an integral part of their lives. Many of us can’t imagine our lives without dogs. Looking in the crystal ball 15, 20, and 25 years from now, I see friends, acquaintances, and myself with a few more wrinkles and sags, surrounded by our canine companions. Two months after adopting our first Greyhound, GiGi, my husband was injured on the job and had to retire at age 63. Six and a half year old GiGi was very shy and timid after graduating from the Second Chance at Life prison program. We decided to adopt our second girl, Myah, just three months after adopting GiGi. I knew she’d benefit from having a sister by observing her when my daughter brought her greyhound to our home. GiGi came to life and was like a different dog. Due to his serious back injury, my husband is limited in his activity. He says that the dogs give him a purpose in life. He often stays home with our two in addition to my daughter’s greyhound, Rita. We call him “Dogie Day Care Dad,” as he provides utmost love and care to the girls. He knows the routine and keeps them on their scheule. In turn, they provide him with lots of loving affection. They always put a smile on his face, no matter how bad he is hurting! We fenced a large area of the yard for the girls to run and play. I take them for daily walks. My husband, daughter and I cannot imagine life without greyhounds. They are so sweet and appreciative of their forever home. We need to spread the word! I wonder what the best way to do this might be. Any thoughts? The greyhound rescue group I volunteer with is in an area of Florida that attracts many retirees with it’s warm weather. Therefore, a good percentage of our adopters are senior citizens… and we have found them to be wonderful! There is even a retirement community in our area which is made of of thousands of condominium homes (55 and up), and they actually have their own little “greyhound group” within the community. It’s pretty awesome. We also have many seniors who volunteer with us and participate at our events and our weekly meet & greets. They are some of our best volunteers we have, as they have more free time than many of the rest of us! Dr Kenny, thanks for your comment. I have to agree with you, as I became a senior citizen myself just last year and have had the hounds since 1980 when I was a “youngster.” LOL An acquaintance adopted her first greyhound – a two-year old – when she was in her low to mid-eighties. She outlived the first greyhound and then got a second one at 89! She outlived that one too. It’s never too late to have a pet greyhound. If eyesight is failing, a light or predominantly white one might work best but that’s not always a requirement. Calm greyhounds and senior citizens might be described as a match made in heaven. My last greyhound died when I was 79, and I would highly recommend a greyhound for the senior citizen. On the other hand, a small dog causes so many accidents ( tripping over and breaking a hip or leg ) that I would never recommend a dog who is very dark coloured and who does not at least come up to your theighs in height. It is sinply too dangerous. One patient tripped on his schipperke and broke his neck on the stairs. The greyound is – without doubt – the dog of choice for the over 75 or over 80 as they are very calm, very neat about the house, and totally without any trace of hostility. They even like rabbits!! !